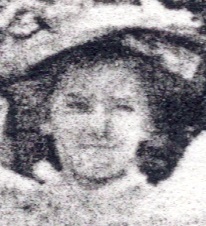 My 2nd-great-grandparents’ youngest daughter died of illness at age 20 in 1911. Her name was Sarah Bernice, but she went by Bernice. She was born in 1891 in Franklin, Ohio and never married. I have only one photo of her. around age 10. Ten years after her death, her older brother, my great-grandfather Walter C. Anderson, named his oldest daughter after his late sister.